The office vacancy rate in the Greenspoint submarket in north Houston increased as Exxon Mobil and other energy firms relocated. HOUSTON – An investment entity led by Lincoln Property Co. and H.I.G. Realty Partners has acquired Greenspoint Place, a six-building office complex in the beleaguered Greenspoint submarket, which has the highest office vacancy rate in the city. The 2 million SF Greenspoint Place property, which has three connecting retail centers, was purchased from Northwestern Mutual Life Insurance Co. The Greenspoint area, located near intersection of Interstate 45 and Beltway 8, was hurt significantly a couple of years ago when Exxon Mobil vacated 2 million square feet to move to its new campus in Springwoods Village. Southwestern Energy and FMC Technologies also moved out of Greenspoint. Only five years ago, the Greenspoint submarket, which has about 12 million SF of office space, reported excellent Class A vacancy of less than 4 percent. But now, the Greenspoint submarket has more empty space than occupied space. The Greenspoint submarket has an availability rate of 57.9 percent in Class A space, according to the second quarter report from CBRE. 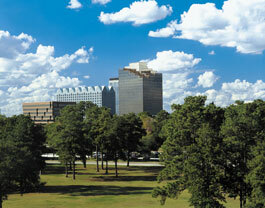 Year-to-date, over 700,000 SF of Greenspoint office space has been emptied (negative net absorption), CBRE reported. The Greenspoint submarket’s vacancy is worse than the Energy Corridor, another casualty in the rapid crash of energy prices, as West Texas Intermediate went from $107 a barrel to less than $30 a barrel. Widespread layoffs followed at Houston energy companies. The decline in the Houston office market led to the foreclosure of the Greenspoint Place project by the lender, Northwestern Mutual in July 2016. Greenspoint Place had been owned by a partnership of Hines and the General Motors Pension Fund since the 1990s. Last year, Hines, an industry leader with $100 billion of assets under management, examined the Greenspoint dynamics and determined that letting the project go to foreclosure was the best option. “Considering the average occupancy rate in this depressed submarket is only about 50 percent, due largely to the fact the energy market is hurting, ownership of the asset will be turned over to the lender. We believe that is the best course of action for the property at this juncture,” Hines stated last year as the foreclosure was completed. Dallas-based Lincoln Property Co., which controls about 9 million SF in Houston, is now buying into Greenspoint near the bottom of the market. The purchase price of the Greenspoint Place complex was not disclosed. Greenspoint Place was developed by Friendswood Development, which was the real estate arm of Exxon years ago. The complex is about 40 percent occupied. Another key to turning around the Greenspoint area is the 1.4 million-SF Greenspoint Mall, facing Interstate 45. The mall has significant vacancy and most of its anchor stores have closed. A 22-acre portion of Greenspoint Mall, including the former Macy’s store, was recently acquired for the development of a truck stop, reports Houston real estate broker Jim Mattox of Jim Mattox Properties. The new owner, Spring Real Estate Investments LLC, led by Zulfiqar Karedia, will develop a truck stop with 17,000-SF of retail space, Mattox said. The 314,000-SF Macy’s building will be leased to new tenants.